You are currently browsing the archive for the Experiences category. I can be somewhat type-a in areas of my passion. This includes the practice of my faith. I tend to play the role or Martha rather than Mary – sometimes even having a bit of disdain, just as Martha did, at Mary’s seemingly lackadaisical attitude toward service. The deep surgery Christ performs on Martha during her ailment is not lost on me. For quite some time, our Lord has been prying my hand from my prideful plow and and healing me to the place where, as Mullins puts it, “I’m lost enough to let myself be lead” For a variety of reasons, the Lord lead me to take somewhat of a sabbatical from church activity. As I did this, I realized how easy it is for me to be over zealous about Christian activity. But our Lord is teaching me. A variety of experiences over the last few months have taught me more about prayer, meditation, solitude, silence, journaling and other disciplines. I’m a horrible student but He is a great and patient teacher. Recently, he persuaded me to take up listening to many books, podcasts and other audio material. It was a way to push me out of the nest of what I know and into the wild blue expanse that I do not know, to add new wonder to my life, and to prove to me how very limited all my knowledge really is anyway. It’s kind of ridiculous that he has to go to such extremes to show me what is so obvious. In listening to the audiobook, “A Whole New Mind” by Daniel H. Pink – see my blog about it – I learned about labyrinths. Contrary to the 1986 film by this name or even the Greek mythology that made them famous, it is a general misconception that labyrinths are the same constructs as mazes. A maze is a puzzle to be solved with many paths that are dead ends, keeping you lost. A labyrinth, on the other hand, has a singular, connected journey to the center and back. They are not puzzles to be solved but an intentionally elongated journey designed to slow your pace into a state of meditation. Mazes are analytical and left-brained where labyrinths are contextual, spiritual and right-brained. 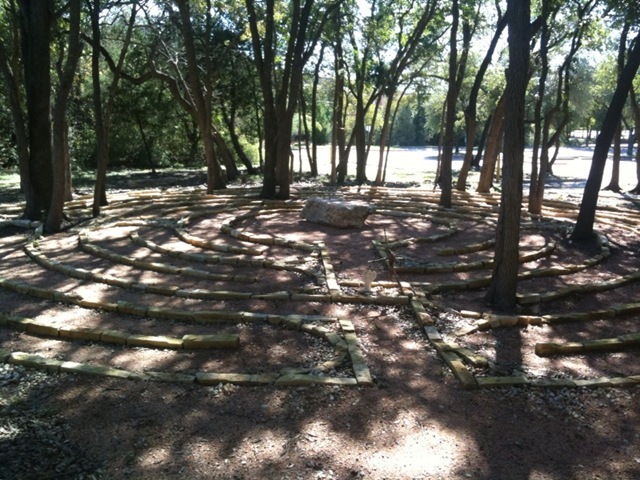 A labyrinth is a walking meditation, a devotional act of worship, and a sacred celebration of life. It’s power is in its simplicity – it presents an orderly path to quiet the mind enabling deeper communion with God as the body moves in a peaceful walking rhythm. With each step, we are able to diminish the cares of the world and tune into the illumined voice of God. Walking the labyrinth is not something to learn or memorize, but something to experience. Learning all of this, God immediately and strongly impressed upon my heart to visit a labyrinth, so I set my heart upon doing it the very next day. First I visited the World-wide Labyrinth Locator at http://labyrinthlocator.com/. There are different layouts, sizes, construction types of labyrinths. 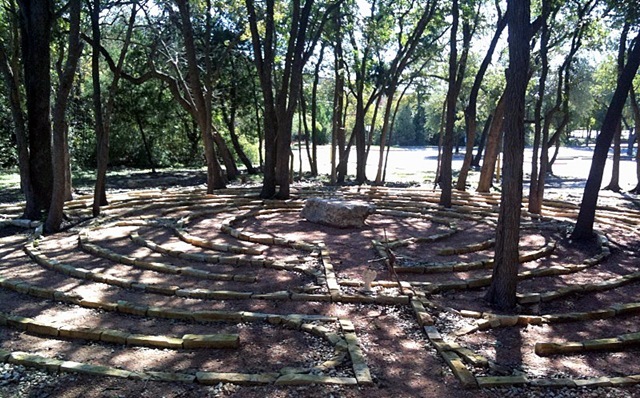 After learning about them and reviewing the one in Georgetown and 13 in Austin, I decided I wanted to visit one based on the medieval design then settled on a beautiful labyrinth at Seton Northwest excited by the feature of trees actually growing in the path of the labyrinth. I wasn’t sure what to expect – should I go for silence or bring some meditative music. I decided to bring it just in case and to decide there whether or not to use it. I loaded the best candidates in a special playlist onto my iPhone and then headed for the labyrinth with the feeling in my heart of embarking on an epic saga. 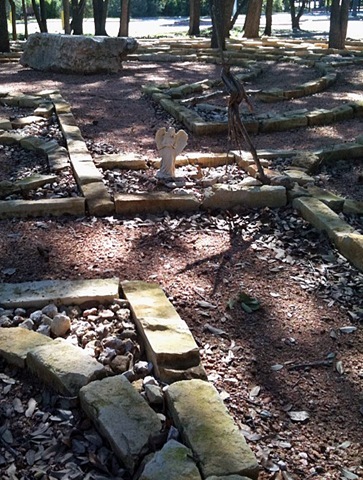 As I walked the labyrinth, I found myself in a deeply stirring encounter with God. I will share the experience in my next blog entry. In the mean time, I thoroughly recommend walking a labyrinth as a form of prayer and mediation. I hope you will experience it soon. It wasn’t really an Italian restaurant. It was only a common Chili’s in north Houston. Still, it served splendidly for the seven of us during our rough and ready reunion following the grave-side funeral of our friend, Darren. Though most of us had occasionally bumped into one of the others, it had been twenty-five years since a group get-together of this size. Sadly, it was the loss of a dear friend and very talented musician that had brought us together this day. 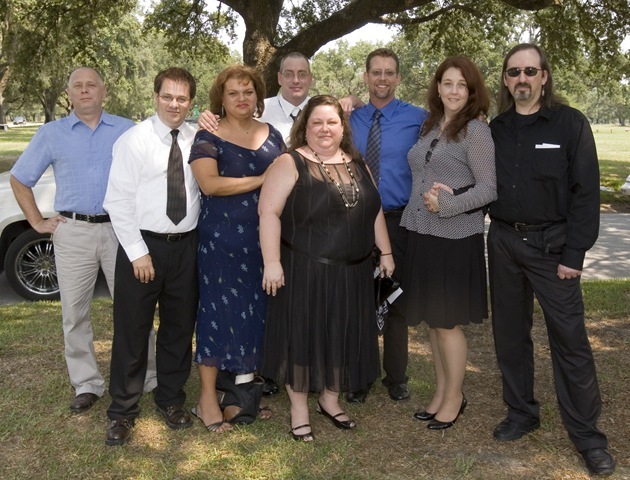 Most of the group lived in Houston but I had driven down that morning from Austin. I had contacted Mike the day before to see if he wanted to drive down with me. He, in turn, contacted Steve who I had not seen since high school. Mike had to make a trip to Brenham that night and we were to pick him up on our way to Houston the next morning. So it was that Steve and I were casually cruising east on 290 as surprised by the spectacular sunrise as we were about the stories we were sharing with each other. By the time we made Brenham to meet Mike, Steve had discovered that my van was not optimal for music and a decision was reached to carry on our voyage in Mike’s vehicle. Despite this, we did not really listen to much music on the way there. Between adding Mike to our reminiscing and Mike’s recurring incoming cell phone calls, there wasn’t much space left for the music. We made a pit stop just before the cemetery to prep ourselves. While there, I was lost in this thought that had been tumbling through my head since I’d heard about Darren’s death. He was an amazing piano player that seemed to me to always play two or three times more keys than anyone else would have played on a given piece of music. His playing was rich and full and looked as effortless as breathing or blinking your eye – and in that much time, he would have perfectly played dozens of keys. It seemed magical and Darren seemed to me to experience a joy that was foreign and elusive to me in that time of my life. 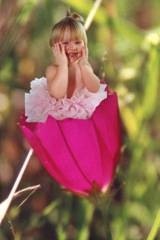 I was thinking how every life we meet and every interaction was like a note in a personalized piece of music that made up the song of our life. We have a moment, maybe a millisecond for that tone before the melody moves onto the next character perhaps to never touch that note again or not until much later – in the next verse or pass through the refrain. These collections of sounds formed parts – verse, refrain, transition – to the ensemble of our lives. So here I am today, hearing the songs of my friends, interacting with them in a common harmony that has not come up on the scales since the early part of the song. For Darren, this song really had ended and he was being called to an eternal encore. When I returned to meet the guys, I told Mike not to settle for crooning , “Don’t end up like me”. While Darren’s masterpiece here has indeed ended, we are just in the middle of the transition. Play on, dear friends, play on. And if you don’t like the sound of it, change it. We were the first of our group to arrive at the cemetery. We signed in, met Darren’s sons, ex-wife, and sister. As more of our friends arrived, we cycled through moments of reunion, grief and celebration of life together waiting for the group exodus to the grave-side ceremony. We stood side by side listening to the minister as sunlight and shade sauntered around us in a peaceful dance. The minister announced that Darren’s son, Ryan, would be playing a song. Ryan explained it was a song his Dad loved and thought was powerful. Then he proceeded to play an acoustic version of Peace of Mind by Boston. It was beautiful and perfect. It was very much Darren and the woman next to me, Michelle, a high school choir friend of Darren’s begin to provide soft background vocals. I could not help but join her. The minister was sharing some of Darren’s path to faith and I was still thinking about how things got here. I didn’t know all the details surrounding Darren’s death but I knew it was somehow tragic and not congruent with my memory of him. Ryan was singing the next song, Word of God Speak by MercyMe. I kept thinking about how to encourage the broken hearted. Michelle’s singing was bolder this time but still soft and sweet like the breeze of the air reminding me of the scripture God had led me to that morning before leaving Austin: “My message and my preaching were not with wise and persuasive words, but with a demonstration of the Spirit’s power”. As Michelle and Ryan were singing “I’m finding myself in the midst of You, Beyond the music, beyond the noise”, I closed my eyes, surrendered to the cool wind as it weaved through the dancing shadow and light, and hummed along praying, “Yes, Lord, by your Spirit and your power”. ation. That is certainly, sadly to say, my experience with this friend and I was sorry about that. It reminded me of an amazing verse of lyrics of another great Christian musician who has gone on to be with the Lord – Rich Mullins. “We are frail. 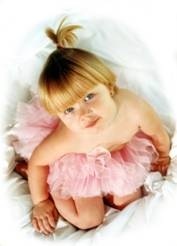 We are fearfully and wonderfully made, forged in the fires of human passion, choking on the fumes of selfish rage. And with these, our hells and our heavens so few inches apart, we must be awfully small and not as strong as we think we are.” Thank you for grace, Father, for we are so in need of grace. Having enough of tragedy, we labored to lay down that mask and return to the mask of comedy for the rest of the lunch. We discussed great memories and fun and how excited we were to see each other. We shared about others that some of us had visited occasionally and even more details and ideas around having a reunion in 2010. Several of the Houston contingent were being pressed to return to work and we still had a trip to Austin but Paul persuaded us to drop by for a quick visit at his home. This gave us an opportunity to change into more comfortable clothes for the return trip and to observe the sizable collection of memorabilia that Paul had been putting up on our Drama Jock Facebook page which led us into another path down memory lane. But lunch and the long day were simultaneously leading us to a desire to lounge the afternoon away on Paul’s exceedingly cozy leather chairs – so we forced ourselves out of this slumber and into the car for the trip home. We were tired as we made our way back to Brenham. We were lost in all the rolling emotions of the day and exhausted with trying to express them with our own word so now the music was a solace and a celebration. Mike gave me the controls of his IPhone and after a return to Boston’s Peace of Mind – it became clear that all three of us knew every word and note perfectly and were sharing in an amazing music healing session. Occasionally, I travel as part of my work experience. Sometimes, this only involves cubes and conference rooms – replicas of the same florescent lights on ceilings and projected lights on screens that can be found at my office in Round Rock with only hurried and dehumanized flights connecting these two worlds. When possible, I attempt to decelerate these express expeditions and mix in some soul-renewing exploration of my interim environment. I was blessed in this way on a recent business trip to San Francisco when afforded an afternoon and evening tour of the town. The first segment of the journey was a walking tour of the Fisherman’s Wharf. As we made our way to the San Francisco Maritime National Historic Park and back, our scavenger hunt rewarded us with shops, street performers, and the beautiful bay as a stage with backdrop views of the distant Alcatraz and the Golden Gate Bridge upstaged by dozens of dancing sailboats and flying fowl – actors performing for the audience on the shore. 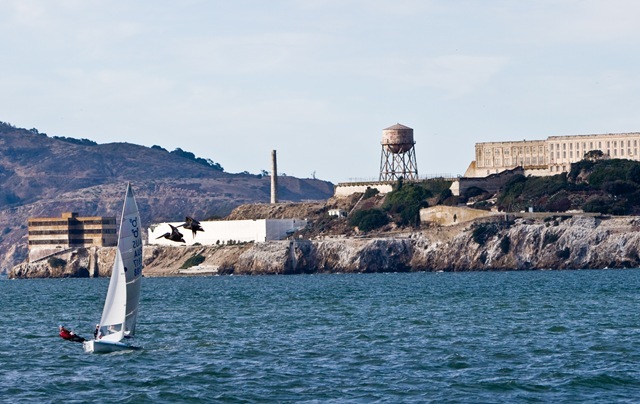 Our tour was interrupted by an exhilarating race back to the airport to deliver one of our business associates but we were soon retracing our steps back into town arriving in Haight-Sudbury just as twilight was kissing the lawn at Golden Gate Park. As we descended into the gated tunnel that dove under a major thoroughfare to the expanded park on the other side, we were greeted by two distinct groups. The first appeared to be large numbers of beer/fun-loving college students on the lawns playing kick/baseball with immense (and boisterous) zeal. The other community was street people, huddling in small, scattered groups at the base of the park’s trees and on the sloping berm. I inadvertantly offended a group of them by creating a photo of their tree-home as they reclined in their pseudo-family room. I politely apologized and demonstrated to them the deletion of the image which was rewarded with a tenuous forgiveness of my uneducated, tourist behavior. Despite the much larger, more mainstream crowd in the park, as the remnant of pale, orange dusk surrendered to the blue-black of night, I couldn’t help but imagine these less idealist, more junkie predecessors of San Francisco’s past hippie lineage as the Morlocks in H. G. Wells’ time traveler’s voyage into the future. The tunnel gate was locked as we returned providing ample evidence that some concern was not unreasonable and we were glad to re-emerge onto a reasonably lit up Haight Street just as Apollo parked his chariot and went to sleep beyond the horizon. 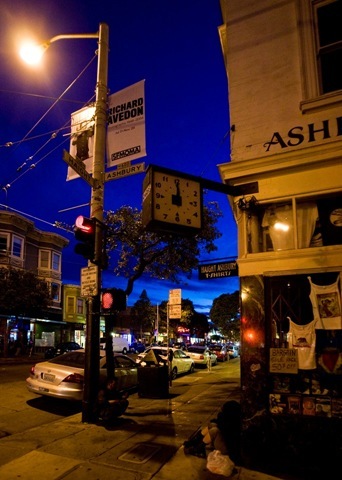 Our brief walking tour of Haight from the park to Ashbury and back was met with more people of street and groups of young teens and twenty-somethings looking for places to party. We ventured into some of the few shops that remained open and continued to collect photo treasures commemorating our atypical adventure through this slightly bizarre world. Leaving the Haight, we drove up Stanyan to Geary, cut over to Park Presidio Boulevard, taking CA-1 through the tunnel and connecting to 101 catapulting us through the Golden Gate Bridge into Sausalito. We stumbled upon an amazing Italian restaurant called Caccivcco Cucina Toscana where we engaged in a wonderful dinner complete with old-world wine and multi-cultural conversation until closing called us again to carry on our quest of the San Francisco night. Returning the way we came and crossing 101 onto Conzelman Road, we found a lookout area and took a few photos of the bridge. We tried to explore some other angles further up but the road was closed. 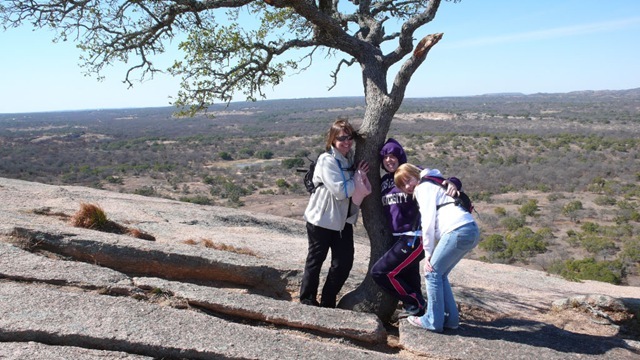 Returning, however, we discovered a ridge with a path to the best lookout area of all. It was quite cold and very dark but we made our way out to the point and took the best photos of the bridge using some of the wood railing as a make-shift tripod. 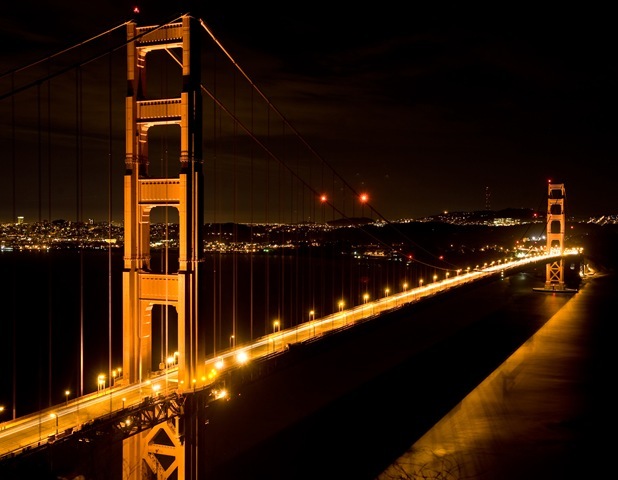 It was two in the morning as we glided back across the bridge, filled our gas tank and purchased some snacks. 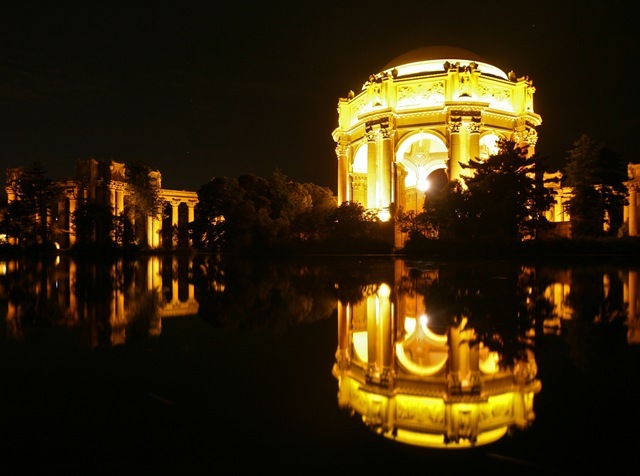 Before heading home, we made one final stop at the Palace of Fine Arts which is incredibly beautiful at night. We took Beach to Divisadero and returned south to Haight coasting through its much calmer and near empty neighborhood to Octavia and the 101 South toward San Jose. We were tired but soul-satisfied with our adventure as we pulled into the Hotel around three. I worried during this safari that I was perhaps imposing on my traveling companion, especially with the wonderful weirdness of the Haight-Ashbury scene. 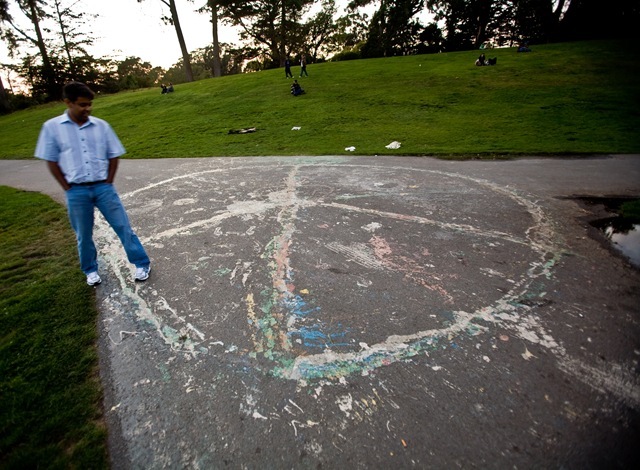 On our flight back, however, as we reviewed the images, he was thanking me – and clarifying that his appreciation was especially for the visit to the hippie center of the universe – precisely because it was a world he would likely not have explored otherwise. It is certainly not the culture of our corporate cubes and we could feel a bit of trepidation about it while still admiring the free-spirited diversity – yet there is more than that. Perhaps the angst is not caused by a concern that we might be hurt by the occupants – but more that there is a part of our soul that connects with this chaos. If we are stepping cautiously on these sidewalks, taking care not to slip off the curb, its perhaps a minor phobia that we might slide uncontrollably into the strange society unable to climb back into our comfortable illusion of a managed and successful life. The values of this world and the values of our own are designed for those who occupy them and are understandably uncomfortable to tourist. Still, to explore this quickened heartbeat – that is good for the soul. 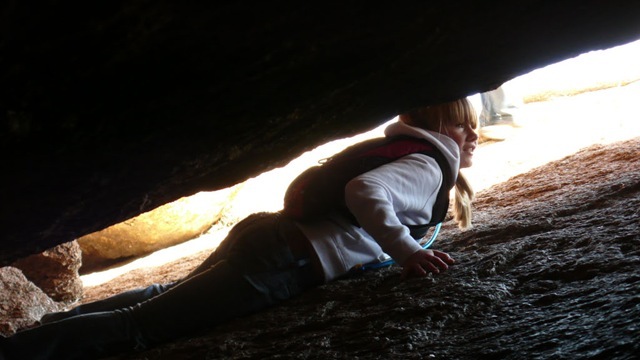 View the photo album on Facebook or since higher resolution on the version on Flickr.